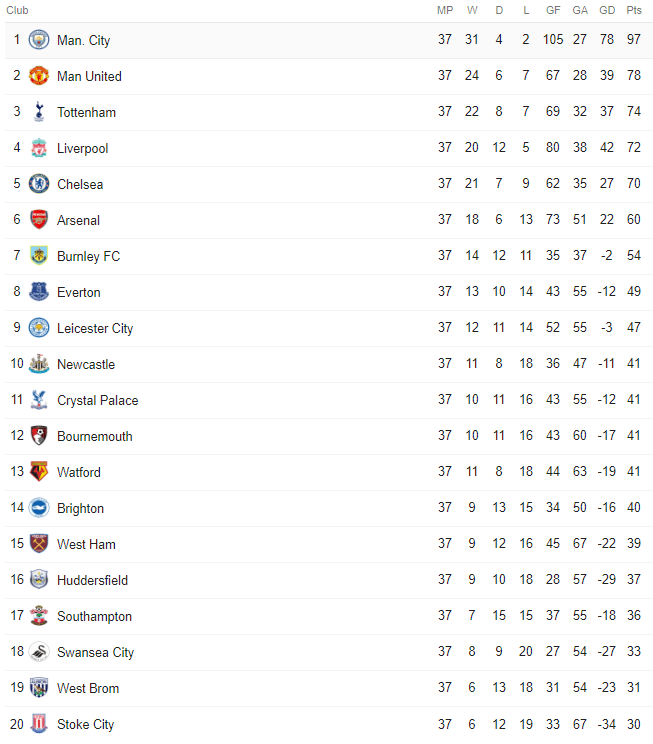 The table below, shows what every club is forecast to get, based on the Premier League positions they currently occupy before the final match. This week it was revealed that Newcastle United were one of six clubs chosen to get a final day bonus, with their matches shown live on this last day of the season. Firstly, every club gets an equal share of £82m each, with Man City down to Stoke all receiving that, helping to make the Premier League one of the fairest of all leagues for splitting the broadcasting income from domestic football. So Newcastle get £82m guaranteed for starters. Secondly, the number of times you are featured live on TV in the UK. With Newcastle selected today, it brings that total to 18 (NUFC Live TV matches listed below) for the season, with only seven clubs shown a higher number of times (see list below). 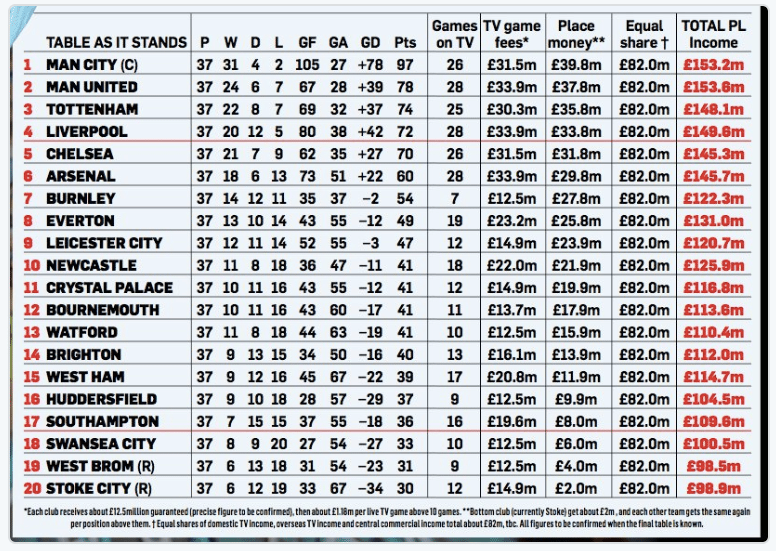 Subsequently, only seven clubs will receive more money than Newcastle when it comes to matches shown live, so that money is also guaranteed now. Newcastle banking another £22m, so despite Burnley doing so well and finishing seventh, because the broadcasters know the wider appeal of NUFC and how many fans they have as well who will tune in, the Magpies bank £9.5m more than Burnley for this. So now we are already up to £102m for Newcastle United, with then the money from league placing still to be added. Thirdly, so at the moment Newcastle are set to receive another £21.9m if they stay in 10th position. That would give them a final forecast total of £125.9m, a figure only bettered by seven other clubs, as it stands. With Leicester also set to receive less even though guaranteed to finish higher in the table, due to only being shown live 12 times compared to 18 for Newcastle. No excuses at all for Mike Ashley now, when it comes to backing Rafa Benitez. The only issue is that the recent four game losing streak means that Newcastle realistically have to win today against Chelsea as five teams below could potentially overtake them, if NUFC did fall below other clubs, it would mean just under £2m less for each place they dropped. The opening 16 Premier League matches saw NUFC selected a remarkable 11 times by the broadcasters. that has dropped off in the second half of the season though and only seven of the next 22 have been selected. Being live on TV hasn’t brought much luck, the 17 games so far seeing 11 defeats, three draws and only three victories (whereas, in the 20 non-live matches, Newcastle have a record of eight wins, five draws and seven defeats).